Farting noises have made me a better mother. And a better wife. I can always make my kids laugh if I’m “farting” in the kitchen while making lunch. And my husband loves it when I let it rip right after we get into bed. Sometimes, when kids are melting down and the house is a mess, and my husband and I think we’re losing our minds, a few fake farts can make all the difference. Last month, I compiled a list of ways to make the most realistic fart noises. It makes me laugh every time I read it (and try it). You can see the entire list here. This tip is shocking — literally. 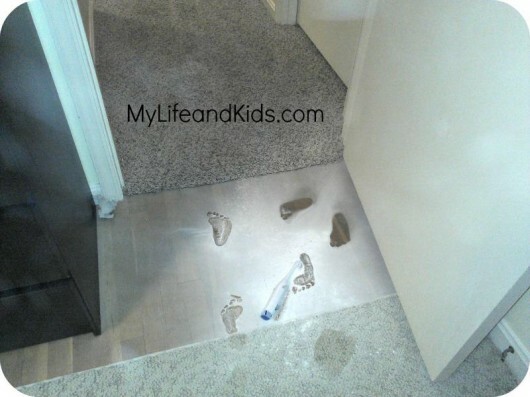 Let’s pretend that your delightful pest of a 2-year-old finds a bottle of baby powder and destroys his room. Baby powder on the bed. On the carpet. On the curtains. Here’s my tip: Do NOT vacuum it up with a vacuum cleaner that has a bag. I learned this the hard way, but you will be shocked. Literally, shocked. The baby powder produces a build-up of static electricity in the vacuum bag, which travels through the vacuum, and will shock the crap out of you — and maybe even spark a little in the outlet. Take my word on this one! Use a bagless vacuum or a shop vac instead. I have three little kids and someone always seems to have a runny nose or a stuffy nose or some type of cough or whatever. A simple stuffy nose used to mean we weren’t sleeping — but thanks to these amazing stuffed animals, we sleep through every cold these days. They’re called Scentsy Buddies, and they are borderline life-changing! You buy the stuffed animal (which is the softest, cutest thing you’ll ever see). Then you buy a scent pack to zip into his back. I picked “Just Breathe” and when my kids have stuffy noses, they sleep with their Scentsy buddy and they can breathe through their nose all night long. No more Vick’s. No more trying to figure out how to help your child breathe at night. Nope – they just need to sleep with their favorite stuffed animal. Anna was recently chosen as one of Parents Magazine’s Top Five Blogs Most Likely to Make You Laugh. Click here to vote for My Life and Kids once per day until February 24th.